Long Phu Quoc Island from north to south at 40 miles, so you do have to think about the proper transportation and saving to be able to explore the entire island. Or jungle trekking enthusiasts would surely love traveled in Phu Quoc. There is a path into the woods off the highway, about 5 miles east Ganh Dau on the northwest side. The paths were unmarked, but easily traversed. This includes fairly easy jungle, you can see the flora and fauna, but will not find wild animals. If you are lazy to walk, riding a bike through the trail can also be done. At the southern end of the island there is a fishing town of An Thoi is well worth a visit. There is also a wide range of fishing boats to be made the object of photography. You can also rent a boat to visit a small island in the south of Phu Quoc. The most beautiful beach in Phu Quoc is located Sao Beach on the southeast corner of the island, about two kilometers north of An Thoi. At the beach there are restaurants that serve delicious dishes. Usually the tourists love to sunbathe on the beach. Suoi Tranh waterfall is located in the woods, about two kilometers from Duong Dong. From this city you still have to go through the path through the forest about one kilometer. In the dry season, water pools below the falls is usually dry, but you still can see the interesting rock formations. If here do not forget to bring a bathing suit because you can bathe in the pool at the end of the walkway. On the west side of the island of Phu Quoc pearls contained Ranch. Of Duong Dong you still have to travel 10 miles to get to the location. This is the right place if you want to buy a gift for a loved one or family. These pearl farms sell products. No less interesting is the Agricultural Pepper. Pepper plants grown creeping high stick. You can also purchase pepper products as souvenirs. For the best fish oil producer in the world, Phu Quoc is also the perfect place to see how the manufacturing process. Tourist maps usually provide some alternative fish oil factories that can be visited. 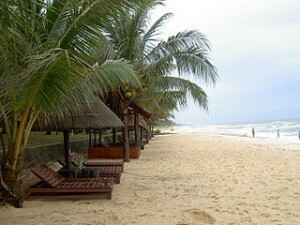 In addition, Ham Ninh Fishing Village on the east coast can also be selected attractions in Phu Quoc. There are two dive sites around Phu Quoc, the southern section precisely on the island near An Thoi. Three locations in northern artifacts dive to a depth of approximately 10 meters which is suitable for novice divers. The location is surrounded by coral reefs is home to beautiful marine animals. In the south there are about 20 dive sites among the 13 small islands. Depth location here between 10 and 40 meters. There are available several dive companies that offer services, such as Flipper Diving clung, Rainbow Divers, X-Dive, and Cocodive. For those who do not want to dive, but still want to enjoy the atmosphere of the underwater Phu Quoc, follow snorkeling tour at a cost of approximately $ 15, includes shuttle to the hotel, the cost of the boat, snorkeling gear, and lunch. Two operating companies are Sunny Boat Trip and John’s Tour. Although you may not travel enthusiast, walk to the market has always been an interesting activity because here you can see the activities of local residents every day. In addition, the market also always be interesting attractions to be photographed. Morning market can be found in Duong Dong in the northeast. And at night you can visit the night market held in the western part of Duong Dong, precisely near the lighthouse. Since most of them are luxury hotel, it’s hard to find accommodation with a friendly price. However, some of these places can be selected. Like the Sea Star Resort is located at Ba Keo 7 Ward Tran Hung Dao Street and Freedomland Phu Quoc Resort is located at Ong Lang Beach.